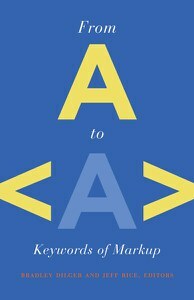 From A to <A>: Keywords of Markup. Ed. Bradley Dilger and Jeff Rice. Minneapolis: University of Minnesota Press, 2010. Each chapter of From A to <A> focuses on a specific piece of HTML markup and begins with a paragraph describing the use and function of that tag and contextualizing its place in the development of Web standards. Appropriately enough, Thomas Rickert’s chapter, “Tarrying with the <head>: The Emergence of Control through Protocol,” begins the collection with a discussion of the <head> tag, suggesting that <head> functions as a protocol extending operations of power through the apparently voluntary use of a set of simple rules that extend throughout the process of Web standardization and development. The collection then moves to “<b> </b>: Exploring Rhetorical Convergences in Transmedia Writing,” Sarah J. Arroyo’s examination of how conversations about deprecated tags like <b> focus on criticisms of the visual culture of markup without delving into more complicated questions of how surface and depth are contiguous and interwoven when Web users take advantage of networked spaces to enact rhetorical movements. Colleen A. Reilly’s chapter, “alt: Accessible Web Design or Token Gesture?” connects the tag <alt> to the alt. * newsgroups, arguing that in both instances “alt” becomes a token gesture of assistance rather than true accommodation of individuals who do not conform to normalized Web or cultural experiences. With “English <A>,” Jeff Rice turns the collection’s attention to how Web users expand and enrich the possibilities of links beyond simple connectors between sites, noting how applications which use links to tag content and create folksonomies build rich networks of connection. Rice thus suggests that English <A> might transform education from pedagogy that focuses on individual learners and individual content areas to one that relies on a networked understanding of relationships. From this discussion of <a>, the collection moves to Brendan Riley’s chapter on <style>, “A Style Guide to the Secrets of <style>,” which looks at the division between HTML codes governing content and form and Cascading Style Sheets (CSS) governing presentation. Riley argues that this division is ultimately untenable, because markup requires intimate connections to stylesheets, and suggests that this interconnection of markup and style simply echoes the ways in which Web writers must make decisions about content and format as they create their pages. Brian Willems’ chapter “An Accidental Imperative: The Menacing Presence of &nbsp;” continues the collection’s examination of the apparent duality of markup by examining the invisible &nbsp; character, which both unifies elements while dividing them and thus becomes a “flickering signifier” that echoes pattern recognition across an array of writing modes. Bob Whipple discusses another pair of deprecated and often-reviled tags in “The Evil Tags, <blink> and <marquee>: Two Icons of Early HTML, and Why Some People Love to Hate Them.” He suggests that early designers’ embrace of these tags and the subsequent backlash against them encapsulates the power and pleasure that non-professional web-designers found in creating their own pages as well as professional designers’ disdain for designs that disregard the primacy of information-oriented or “tasteful” layouts.